Nano-pixels to serve as display technology of the future? Researchers at Oxford University have demonstrated world's first nano-pixels, an innovation that may one day be used by displays or to create artificial retinas that function like a real eye. 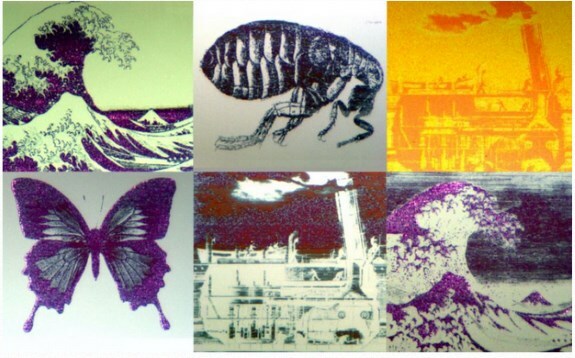 The images you can see in the photo below are a thousand times smaller than the width of a human hair, they were created by stacking 7nm thick layes of the phase-change material GST (Germanium-Antimony-Tellurium) between two transparent electrodes to create visual patterns like the ones below. If the technology is commercially viable it could pave the way towards the creation of a display that uses 300x300 nanometer pixels as its basic image building block. Now, forming still images is one thing, but the research specifically stated that the microscopic stacks can be made to be electrically switched on and off. With a few specific adjustments, it can also be made to produce different colors. This opens the exciting possibility of creating new types of screens that would make even 4K HD seem low quality. A single 300×300 nm pixel would be its basic image building block. Aside from extremely high-resolution displays, the concept also brings up the possibility of developing artificial retinas that could finally function like the real thing, by using the nano-pixels as photoreceptors. Also, being just a few nanometers thick, it may also have several innovative uses in current smart film technologies.